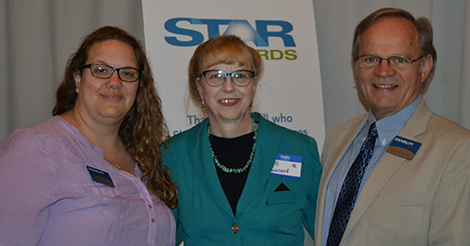 Patti Townsend (center) with Miranda Grunwell, Volunteer Coordinator, and Joel Cooper, President & CEO of Disability Network Southwest Michigan, at the STAR Awards presentation. Volunteers from the Kalamazoo area were honored for their contributions last week at the annual STAR Awards (Sharing Time And Resources) celebration. Disability Network Southwest Michigan is very proud to nominated Patti Townsend who won this year’s STAR Award in the category of Adult Volunteer of the Year. This year, Patti is celebrating 30 years of volunteer service dedicated to Disability Network Southwest Michigan. Over the years she has been a passionate advocate on behalf of people with disabilities and has had many different roles that have supported the work and mission of Disability Network. In 2016 her main role has been as a member of Disability Network’s Human Resources Committee. This Committee focuses their expertise and time providing consultation and guidance to ensure the most effective and appropriate employment and administration policies and procedures. Patti also volunteers with many other organizations in the Kalamazoo community where she has made a huge impact. She is the current president of Edison Business Association, leading the organization in their work to support businesses of the Edison neighborhood. Patti is also an active member with the Daughters of Union Veterans of Civil War where she helps clean grave stones, puts flags out on gravestones on Memorial Day, assists families in locating lost soldiers and obtains proper graves for those soldiers who do not have one. Last year, this group planted over 200 flower arrangements at Riverside Cemetery. Patti is also an active member of the Sunrise Kiwanis where she helps with Christmas shopping for low income families in the community, passes out dictionaries to three schools and raising money for Kairos Dwelling, a free hospice home in Kalamazoo. Patti also coordinates the Life Saver program that raises awareness about child abuse in our community. Patti’s passion for volunteering started when she was a teenager in high school and has grown over the years. Patti has a large heart with a great passion for making the community a better place. She first started volunteering for Disability Network Southwest Michigan in 1987 in an effort to kick off the new TTY/TDD relay system, a telecommunications device for the Deaf that Disability Network was offering to the community. At the time, she was a home healthcare worker and thought learning the system could help her clients and the community. Patti volunteered 2 hours per week answering the TTY/TDD device while running her own business and raising her family. Quickly she became more involved with Disability Network, learning all she could about the disability community and the services our office provided. Throughout her 30 year history with Disability Network, she has served on our board of directors for a total of 6 years, served as Chairperson of the Policy & Procedure committee, and helped create and implement our Safety committee where she created our first ever evacuation plan and developed a safety system for staff to use to track who is or is not in the building. Today, Patti continues to be a great reminder of the history of our organization and works endlessly to make sure other others know about Disability Network’s programs and services.